Refrigerated trucks and vans have contributed to a network of growing delivery markets. They are the perfect resource for small businesses and companies looking to deliver quality products and services. A refrigerated truck could mean the difference between your perishable goods making it to the sales floor or the waste bin. If your business is responsible for delivering perishable goods at their freshest, then you have come to the right place. South Bay Ford Commercial offers the latest and greatest in Ford refrigeration vans and trucks. While the 2018 Ford Transit was built for either a cargo or very popular work van, this full-size Ford van is also one of the most ideal refrigerated vans in LA. How is this possible? 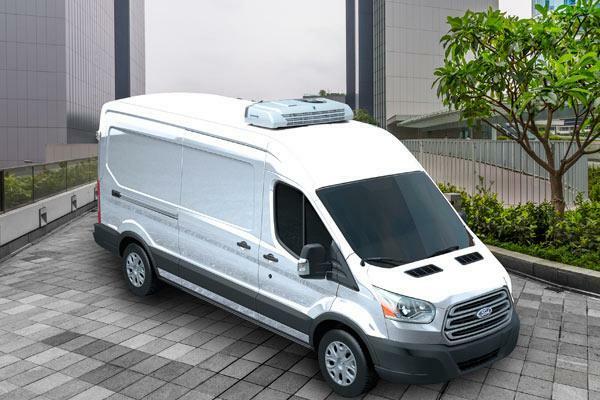 Thanks to the largest distributer of refrigeration vans in the United States, the popular Ford Transit has been converted to a refrigeration unit on wheels. Beginning with a wood frame, laid by Delta-Stag, alongside the floors and the walls. After, a polyurethane foam is sprayed and leveled for ideal insulation. After the aluminum, odor free and easy to clean ChemLight interior is setup the Thermo King engine-controlled refrigeration unit is installed. The nicest thing about this unit is that it can be controlled by the driver vs. having to go in the back of the van to reset the temperature for each delivery. Available in three roof sizes (low, medium and high) for all your perishable delivery needs, the Transit receives its power from three strong and efficient engine choices, including a standard 3.7-liter V6 (275 HP, 260 lb-ft of torque), an optional turbocharged 3.2-liter diesel-powered inline five-cylinder (185 HP, 350 lb-ft) and an optional turbocharged 3.5-liter V6 (310 HP, 400 lb-ft. Each of these engines are partnered with a select-shift six-speed transmission that offers better drivability and fuel economy. Although the Ford Transit Van is the easiest to upfit into a refrigeration vehicle, South Bay Ford also specializes in the upgrade of other Ford commercial vehicles. So, if you are in need of a different fleet of refrigerated trucks in Los Angeles, contact South Bay Ford to discuss available upfit opportunities. Along with creation of a top-performing refrigeration vehicle, the specialists at the leading Hawthorne, CA Commercial Ford dealer also foster close working relationships with local distributors to procure the highest quality tow truck and fuel-efficient Ford truck upfits available. As your trusted Commercial Headquarters, South Bay Ford also offers the delivery of specialized commercial vehicles throughout the United States. This means hassle-free distribution of your new Refrigeration Van/Truck, Parcel, Linen, Bakery, Food, Work Truck, Van, or Utility vehicle right to your door. Are you ready to get behind the wheel of the perfect refrigerated vehicle? Then, what are you waiting for? Come on down! We at South Bay Ford Commercial want to be the first place you think of for all your custom commercial vehicle upfit needs.